Yep, it’s time to hit the road again for more genealogy fun. Every other year I drive up north from Sunny, hot and uber humid Orlando to enjoy the cooler fall weather of Connecticut and Rhode Island. So what’s on the agenda this year? Well, I thought I’d through out a few sites I’m planning on visiting and see if anyone has any suggestions of Wells, Rogers, Crandall, Stillman, etc, family sites to see. Visit Oak Grove Cemetery in Ashaway. Time to do my check on the Wells family plot. I’m pretty sure my grandparents stones are in need of a cleaning. Visit the Thompson Wells Lot in Hopkinton. Believe it or not, there are no photos on findagrave.com of this small cemetery, so I’ll stop by and snap a few pics of all the stones. It’s small so shouldn’t take long. 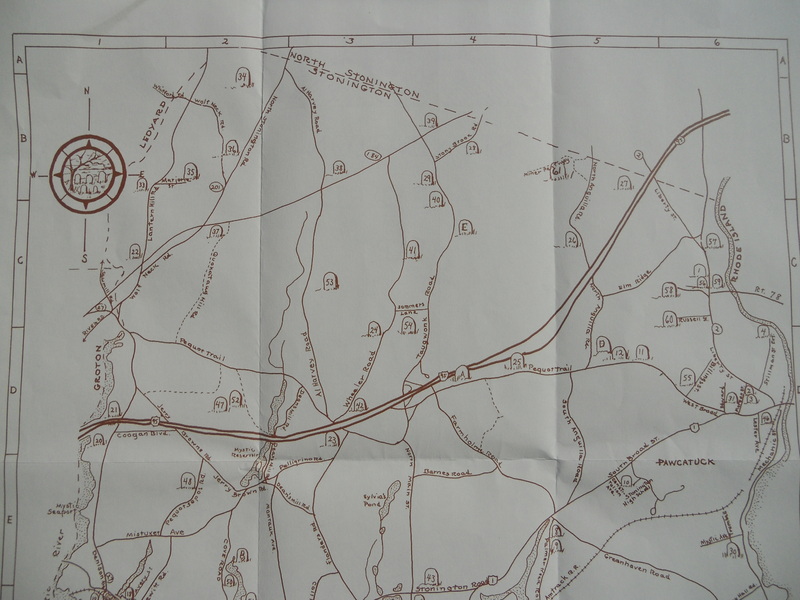 I’m also planning on doing some hiking in Hopkinton on the Nature Conservancy trails up to Long Pond. Absolutely beautiful trails to the most scenic spot in Hopkinton. I’m thinking about going to Newport and wandering around as well. I’ve driven through but have never really walked the town. Visit the New London County Historical Society Library to see what goodies I can find. Found tons of great stuff on the Rogers family last time. Visit Cedar Grove Cemetery. I got a message through findagrave.com that my entry for Moses Rogers was in error and he isn’t buried there. thought I might go take me a looksy and see what Rogers are there. Visit the Brown-Randall Cemetery in North Stonington. Again, no photos on findagrave.com. Lots of really old Randall stones. Revisit the Burdick-Culver Cemetery in the Barn Island sanctuary over in Stonington. Was a fun and easy hike to a lovely cemetery. If I have time, I’ll squeeze it in. There’s a Rogers Burying Ground in Salem I’d like to see. No photos or map on Findagrave.com All it says is it’s off of 82 about 1500 feet. Gee, what a help… Anyone know where it is? I may also stop by the Rogers Cemetery at Mamacock Farm down on the grounds of Connecticut College. 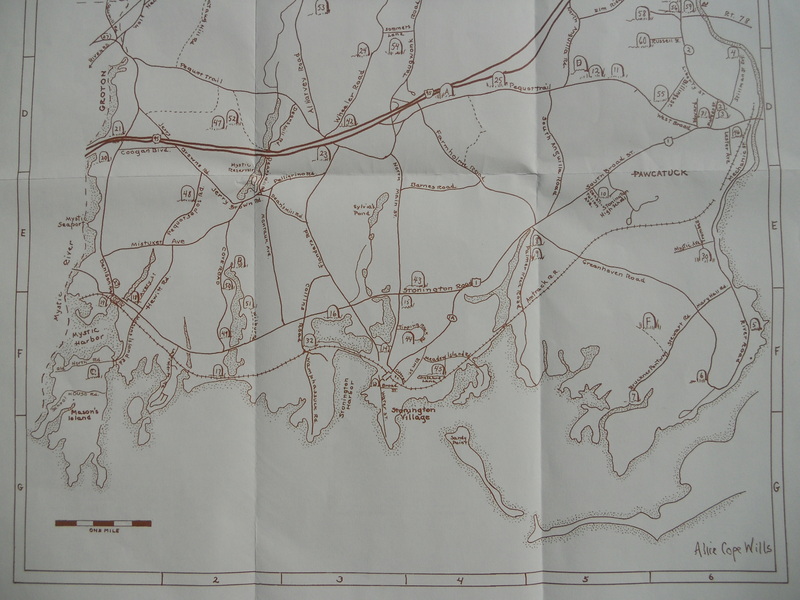 I’ll also be doing a lot of wandering around Mystic and of course Stonington. Since my third novel, the one about the Rogers family, mostly takes place in Stonington, I’m excited to revisit the town that inspired my writing journey. So far, that’s all I’ve got. 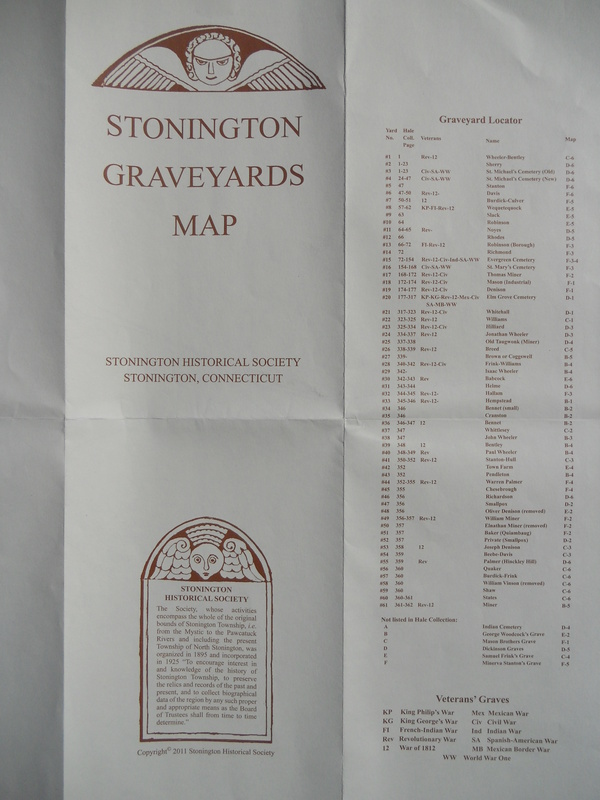 While in Stonington, CT on my vacation, I purchased this map of all the cemeteries in the town. It sure would have come in handy for some pre-trip planning so I thought I’d pass it on to you, my readers, in hopes that it might be of use to you as well. If you click on the images (when on the page on the blog) you will enlarge them. I realized the other day that I have never really researched the Randall side of the family tree. Thankful Randall is my 6th Great Grandmother. She married John Maxson the 3rd. Thankful was born about 1703 in Stonington, CT and died in 1785 in Westerly, RI. Her parents were Matthew Randall and Eleanor Utter. 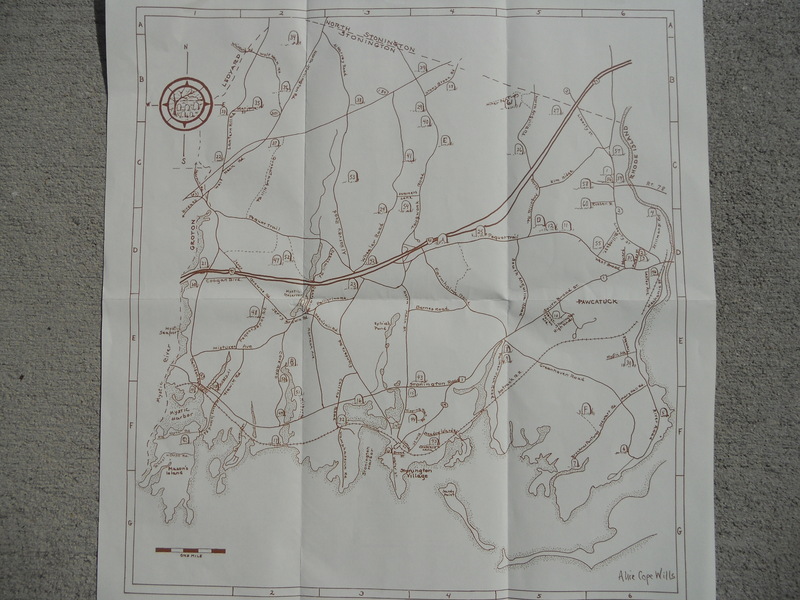 Matthew was born 1671 in Hopkinton, RI and died December 19, 1735 in Westerly. Matthew’s father is John Randall Sr. (1629-1685) and seems to be the immigrant ancestor, born in Bath, England and died in Westerly. I’ve always wanted to visit Bath. I’m a big Jane Austen fan and a lot of her books take place in Bath. John Randall Sr’s parents were Matthew Randall and Elizabeth Moorford. I go back one more generation to another John Randall but his details are sketchy. I guess it’s ironic that some people might consider tracing a line in your family back 11 generations something but not me. There aren’t a lot of details attached to this line. Not any book references or back up. Anyone know a good reference material source for them? If so, do share. John Maxson the 3rd and Thankful Randall are grandparents 2 times of mine. Through their sons Matthew and David. More cousins marrying cousins I suppose.